Ever dream of piloting a giant robot like in the video games and Japanese cartoons? 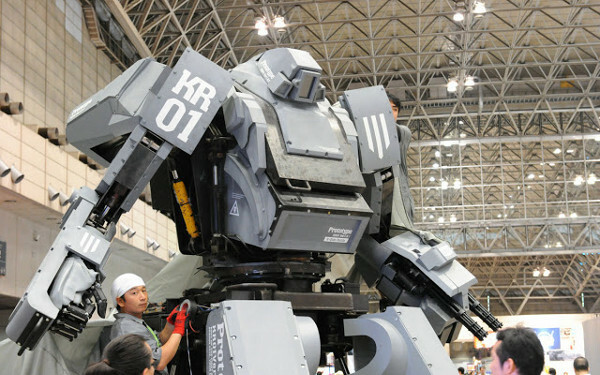 For a mere $1.3 million you can buy a custom mech built to order called the Kuratas built by Suidobashi Heavy Industries. The Seabreacher from Innespace Productions is available in a one or two seat configuration and is a custom built to order submersible watercraft starting around $65,000 capable of diving and jumping out of the water. Move over Hummer there’s a new kid on the block. The Marauder from Paramount Group, is capable of driving through brick walls and withstanding the blast of seven pounds of plastic explosives directed at the underside while still being drivable. This is the ultimate off road vehicle available to civilians. I’d hate to pay for the fuel this thing must chug but it sure looks fun to drive. Ever want to experience the thrill of flying a fighter jet? Well now you can, sort of. The Viper Jet MKII is a personal jet, minus the weapons systems. Capable of 437 MPH (703 KPH) this should appeal to thrill seekers feeling the need for speed as well as aviation enthusiasts. For even more fun in the water there is the Flyboard water jet pack from Zapata Racing. For about $6,600 you can fly, hover and dive into and over water. Just bolt onto the engine of a jet ski and go. The Flyboard water jet pack is fine as long as you’re above water but what if you want to fly around the city or other areas? The Go Fast Jet Pack by made by Go Fast Sports will soon be selling the Falcon model jet pack to qualified individuals who undergo extensive training in their flight simulator. If only I had the money I would have all of these. This entry was posted by Fresh Dub on October 8, 2013 at 3:09 pm, and is filed under Sports. Follow any responses to this post through RSS 2.0. You can leave a response or trackback from your own site.